The Fenn Upper School (grades eight and nine) is designed to build on skills nurtured in earlier grades and to prepare boys well for the demands of challenging secondary school curricula. Our rigorous academic program, emphasizing the development of reading, writing, and critical thinking skills, combined with our wide range of extra-curricular activities that stress the importance of leadership in athletics, arts, and service, enables Fenn graduates to find success in high school, college, and life. While many boys choose to attend public school after Fenn, the great majority of our students apply and matriculate to independent schools. 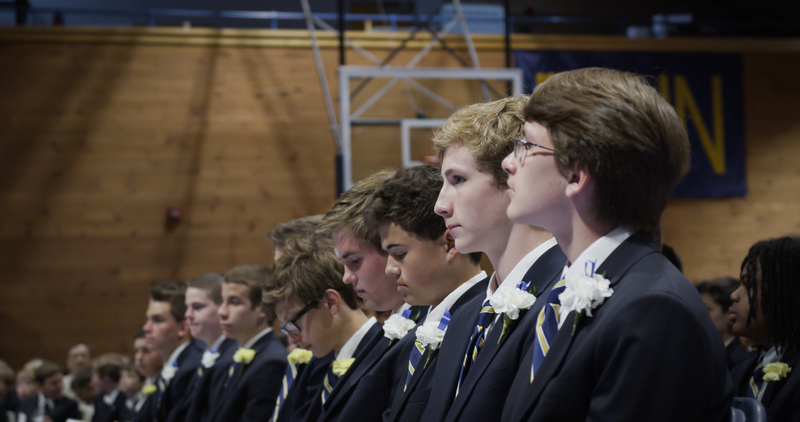 Each year a high percentage of boys are accepted to their first choice schools; as admission to top-tier schools has become increasingly competitive, Fenn has maintained its commitment to providing an excellent foundation on which to build at the high school level. The Secondary School Counseling Office supports students and families through both the public and private school placement processes and ultimately seeks to match Fenn graduates with appropriate secondary schools in terms of academic potential, talents, skills, and interests. Fenn alumni have an exemplary record of leadership at their next schools as student government officials, captains of athletic teams, recipients of visual and performing art awards, and organizers of community service initiatives. We take pride in the success of our graduates whose achievements are often noted by secondary schools, and we keep close ties with these young men through our active Alumni Association. TueSep24 Peer Advocate training in the Library 1:15 to 4:15 p.m.